There is nothing like a quick bite that gets you going. I can easily say this simple and quick Potato Sandwich was one of those dishes I made during my early years of cooking before marriage. I don’t exactly remember when I started loving this sandwich, but this was prepared quite often at home when I was a child. This was the quickest dish that Amma would dish out when she has excess bread on hand. Hubby dear would always comment how I love anything with bread. I was so happy knowing that Konda has the same taste. When Amma made this Tawa Alu Sandwich, Konda was confused having two dishes she loved, as I had made Uggani for dinner. She didn’t want to miss out either. So finally she said she would taste both. This is a typical sandwich with South indian flovours. Boil the potatoes either in a pressure cooker or in microwave for 6 mins. If you are cooking it in mw, once done, immediately put it in water so that the skin comes out well. You can either mash it roughly or very fine. It depends how you like it. We mostly mash it roughly with huge potato pieces in between. Heat a pan with oil, add mustard seeds, once it splutters, add the finely chopped onions, chopped green chilies, curry leaves and garlic. Saute till the onions are done. Once the onions are done, add the boiled potatoes, mix well, add the turmeric and salt. Cover and simmer for 5 mins until the stuffing gets cooked well. Trim the bread slices on sides. Heat a tawa, grease with ghee. Place all the slices on the tawa, simmer to low flame. Scoop the alu stuffing on two slices. Once the bread gets crispy, place the other slices on the stuffed slices. Press well for it to stick together. Simmer again for 2 mins. Cut diagonally and serve with ketchup. Notes: Remove the chillies from the stuffing before you use them for stuffing. Yummy sandwich. Simple yet great..
Love this simple and tasty one..
my mom used to make such sandwich..when i was in school…..looks yummy…..
Lovely and appetizing sandwitch…really quick to make and tasty as well ! Very Filling Meal!!!! Anything with Potato is always welcome!!! 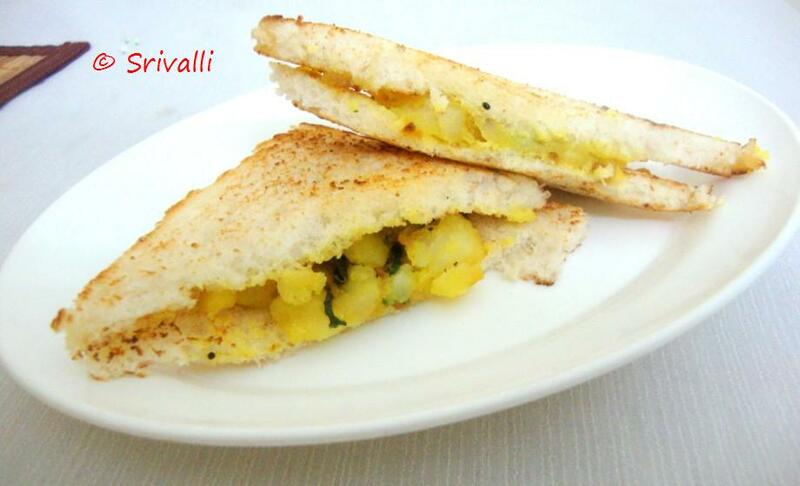 sandwitches are my all time favourite.Love the indian twist.Have linked my jalebi to kids delight. Perfect for kids breakfast or lunch box. Can finish them off in no time. Looks great and a filling breakfast! This surely looks filling and delicious at the same time..thanks for sharing! Feel like having this delicious sandwich,,yummm! this is my favorite with left over curry!…yumm yumm! This is a favorite of mine too. I usually make it in sandwich maker. 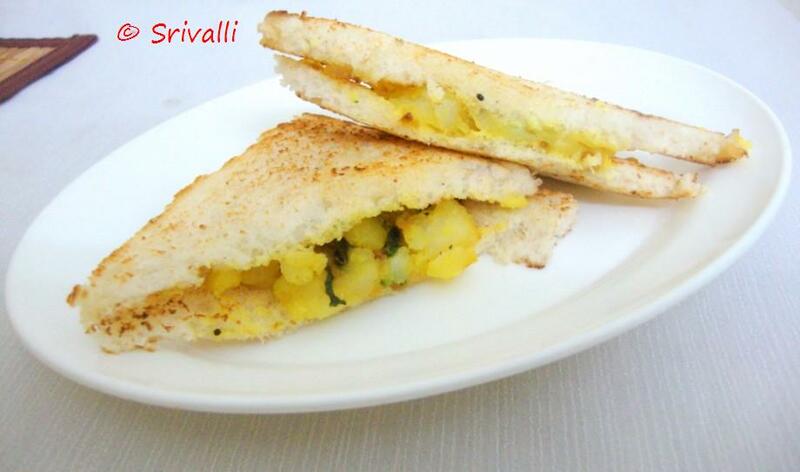 superb breakfas idea my fav too looks yumm Valli.